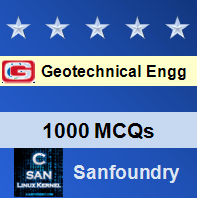 This set of Geotechnical Engineering Multiple Choice Questions & Answers (MCQs) focuses on “Dynamic analysis of block foundations”. Explanation: Barken’s method is based on linear spring theory. The method neglects the effect of damping and participating in the soil mass. Explanation: In the general case, rotation about y, z and x-axes are respectively known as rocking, yawning and pitching. 3. Barken’s method is used in ___________ places. Explanation: Barken’s method is very much used in design offices. Explanation: If the combined C.G. of the machine and foundation lies in the same vertical line as the centroid of the base plane, then the vertical and translation and twisting modes are uncoupled. 5. The value of kx for the elastic support of soil is given by which of the following expression? For rocking motion: Kϴy: Cϴ Iy. 6. The permissible amplitude should not exceed ___________ for reciprocating machine. Explanation: The permissible amplitude should not exceed the limiting amplitude for the machine prescribed by the manufacturers. 7. The methods of Pauw and Balakrishna Rao are based on ___________ assumptions. Explanation: The method of Pauw and Balakrishna Rao are based on the assumption that a certain mass of soil participates in the vibration with the foundation. Explanation: According to Barken, the coefficient of elastic uniform shear Cτ for foundation resting on elastic support is taken as 0.5 Cu. 9. If foundation block is supported by an elastic pad of contact area A and thickness t, the value of stiffness factor for vertical motion is given by which of the following expression? For rocking motion: Kϴy = Ely/t. Explanation: ωn1 and ωn2 are the two natural frequencies representing the coupled action (i.e., sliding along x-axis and rocking about the y-axis).